A big expansion in the amount of electricity generated from offshore wind power has been announced by the UK Government. Licences are being issued for thousands of turbines to be built off the British coast to generate as much energy as around six nuclear power stations. It will also make a major contribution to the government's targets for renewable energy and create up to 20,000 jobs. It is the biggest single step taken to increase the amount of electricity produced without polluting the atmosphere, BBC environment correspondent Tim Hirsch said. Trade and Industry Secretary Patricia Hewitt announced on Monday the leasing of large areas of the seabed in three areas of the country. Ms Hewitt said the move was widely supported by the public who agreed with the government that cleaner sources of energy were needed. "We have got the best wind resources in the whole of Europe and it is crazy that we are lagging behind countries like Germany and Spain and Denmark, when we have the great expertise in offshore developments that we built up with North Sea oil," she told the BBC. The move has been welcomed by environmental groups but some sites will face objections because of a possible impact on birds and wildlife. Friends of the Earth said it was delighted with the plans. "Hopefully this marks the start of a massive programme to harness the considerable opportunities offered by wind, tides and waves," said energy campaigner Bryony Worthington. "Renewable energy has the potential to provide all our energy needs and is a clean, safe and affordable alternative to nuclear energy and inefficient coal-fired power stations." Greenpeace spokesman Rob Gueterbock said the environmental lobby group had no hesitation in applauding the government. "For 30 years Greenpeace has opposed the pollution of our oceans but can today fully support this massive commitment to harness wind power at sea," he said. "Global warming poses a unique threat to our planet, but the government is now demonstrating the ambition needed to defeat it." 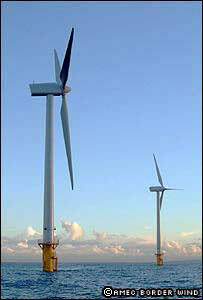 The British Wind Energy Association said it was "fantastic news". Chief executive Marcus Rand said: "We have the best offshore wind resource in Europe and today's announcement signals that we are now on track to seriously develop it. "Successful projects from this announcement could account for over half of the government's 10% target and could be supplying clean electricity to four million households by 2010." National Wind Power, which is currently building the country's first large scale offshore wind farm off the Welsh coast, described the move as "a serious commitment". "This is the first step of the launch of what is going to be the biggest step in renewable energy in this country," managing director Alan Moore the BBC Radio 4 Today programme. However, he warned electricity bills could rise as a result. "There will be a cost to renewable energy. Renewable energy is more expensive than gas-fired because gas prices are very low at the moment," he said. "Bills would go up but they would be in line with those published in the energy White Paper." But he added: "Until we achieve something like 20% renewable energy there will not be any significant problems of costs for the national electricity system." Ms Hewitt dismissed claims of price rises, saying: "The more we build of these offshore wind farms the more the price will drop as people learn to do it more efficiently." She said investment in energy efficiency would also be increased to minimise energy waste from poorly insulated houses. "As we sort out the energy efficiency side, we can make sure the bills to consumers don't go up because people will need less electricity to get the same amount of warmth and power." The Ministry of Defence already objects to some wind projects because of interference with its radar systems. "Technically it is an enormous challenge"
Q&A: The costs of going green?